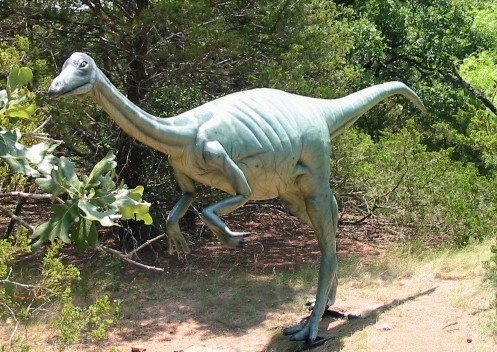 Ornithomimus is a very well known and commonly found dinosaur. First discovered in Colorado in 1889. Ornithomimus sparked the first discussions among scientists that birds may have descended from dinosaurs. Its name even means that it looks like a bird, and its speed and size is often compared to that of a modern day ostrich. They were all fast-running meat-eaters with keen eyesight. They had no teeth, and their heads were too small to eat large creatures, so they probably ate small animals like lizards, insects, and small mammals. Their diet may have also consisted of eggs, nuts, and plants. Although its head was small, it had a large brain-case, and is considered one of the most intelligent dinosaurs.